Uncategories Bank customers urge CBN to stop ATM charges. Bank customers urge CBN to stop ATM charges. 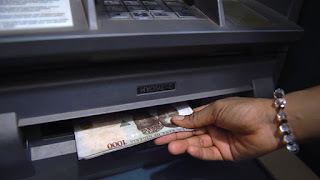 Some customers of commercial banks in the Federal Capital Territory (FCT) have appealed to the Central Bank of Nigeria (CBN) to stop charges on transactions made through Automated Teller Machines (ATMs). The customers, who made the call in separate interviews with News Agency of Nigeria (NAN) in Gwagwalada on Monday, described the maintenance and transaction fees as well as other charges levied by the banks on ATM transactions as “worrisome and fraudulent”. They noted that customers’ withdrawals with the ATMs of other banks had been unattractive because of the continued charge of N65 for every transaction, while commercial banks in the FCT had re-programmed their ATM machines. They said that the ATMs of most banks in the FCT dispensed only N10,000 per transaction, adding that customers were, therefore, forced to make many withdrawals to enable the banks to earn more through charges. The customers moaned that if they had a cause to withdraw N100,000 or more through other banks’ ATMs, it meant they would be made to part with more cash under the guise of ATM charges. Mr Godwin Onmonya, a Zenith Bank customer in Gwagwalada, said that the ATMs of virtually all the banks in the neighbourhood dispensed a maximum of N10,000 per transaction. “If you want to make withdrawals, you will discover that only few ATMs are dispensing and they only dispense N10,000 per transaction. “Recently, I wanted to withdraw above N100,000 and I went to another bank, only to discover that its ATM was dispensing only N10,000 per transaction.“I also discovered I was charged N65 for every transaction, as I had exceeded the mandatory three withdrawals limit; this is outrageous,” he said. Mr Abraham Gado, another bank customer in Kwali Area Council, said that he often received alerts for charges like management, maintenance and commitment fees as well as other frivolous charges after ATM transactions. “These banks are making huge money to the detriment of poor Nigerians; imagine the collection of N100 charged as maintenance fees from just five million citizens.“Our ATM cards are always with us and not in the banks; so, I don’t actually know what they are maintaining. “Even as regards the N65 charge which CBN authorised should be charged after three transactions, I am not sure the banks are following the rule, judging by the number of debit alerts we usually receive. “The concerned authorities should please look into this matter because people are suffering; there is no money in the country, yet the banks are ripping off their customers,’’ Gado said. Mrs Sarah Bako, another customer in Abaji Area Council, recalled an instance when withdrew N100,000 from her account with a First Bank ATM, saying that she was charged N65 per transaction. Saying that was not her first experience, Bako described the practice as “fraudulent and an act of robbing the people’’.She urged the CBN to urgently intervene in the matter, with a view to curbing excessive charges on ATM withdrawals by commercial banks. Bako, however, called for the establishment of more banks in Abaji Area Council in order to boost commercial activities in the area, saying that First Bank Plc. was the only commercial bank operating in the neighbourhood. “People travel from neighbouring villages like Rubochi, Nuku, Chikara, Dangara, Bukpe, Atako and other faraway places to Abaji central area just for bank transactions.“We have First Bank as the only commercial bank in the whole of Abaji Area Council and that is not too good for business activities in the area. “First Bank is the only bank operating in Abaji; for a long time, we have been clamouring for the presence of other banks in our area to reduce the stress but so far, nothing has been done,” she said. NAN recalls that the Senate recently called on the CBN to suspend the ATM card maintenance charges being deducted from customers’ accounts, following a motion moved by Sen. Gbenga Ashafa (APC-Lagos East).